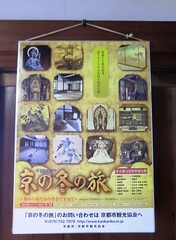 Mie-do, known as the Founder’s Hall, stands to the left of the bell tower. The current structure dates from the 17th century reconstruction. 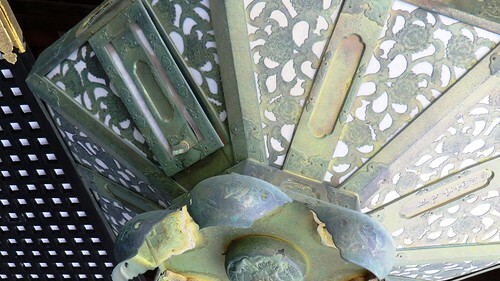 The metal work and lattice wooden shutters were originally part of Seiryu-den, a building on the imperial palace grounds that was built in the early 1600s. 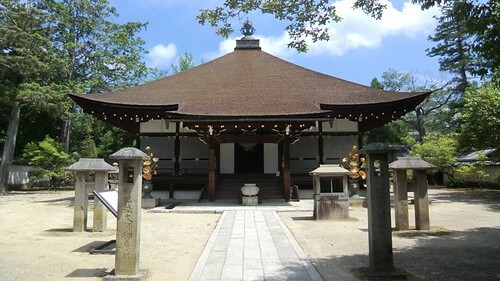 The hall enshrines three figures who are important in the history of Shingon Buddhism and Ninna-ji Temple: Kukai, also known as Kobo Daishi, founder of the Shingon sect; Emperor Uda, the founder of Ninna-ji Temple; and Prince Shōshin, the second abbot of the temple. It is a small building at 10m on each side, but its hiwadabuki (pressed bark roof) and small stature is meant to invoke the image and quiet atmosphere of the temple at which Kukai himself is said to have lived. I took a good look at Mie-do for the first time the other day and thought this lantern was particularly beautiful. Mie-do is next in line for a spotlight post, be on the look out for it on Monday!